London - Marko Arnautovic scored a brilliant 95th-minute equaliser as Stoke City earned a 1-1 draw at West Ham United on Saturday in a mid-table Premier League tussle at Upton Park. A glorious early free-kick from left-back Aaron Cresswell looked destined to earn West Ham only a second win in 10 matches. But Austrian forward Arnautovic produced a solo effort in stoppage time to prevent Stoke slipping to a fourth successive defeat, which would have equalled their worst run in the Premier League. 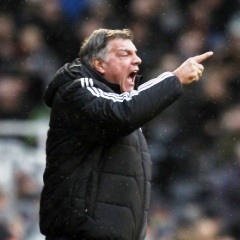 The result meant that Sam Allardyce's West Ham remained above Stoke on goal difference in ninth place, with neither a European push nor the threat of relegation a concern for either club. While Ecuador striker Enner Valencia returned for West Ham after a toe injury, Stoke recalled Arnautovic and Victor Moses, who was ineligible for last weekend's 2-1 loss at his parent club Chelsea. Stoke midfielder Charlie Adam's 65-yard lob against Chelsea was one of several memorable strikes in the English top flight last weekend and Cresswell got in on the act with a goal to savour in the seventh minute. The position of the free-kick, slightly to the left of centre, appeared to favour right-footer Mark Noble, but he ran over the ball and it was Cresswell who stepped up to swirl a sweet strike into the top-right corner. Jon Walters chanced his arm from similar range for Stoke, forcing Adrian to save smartly, while Adam echoed his Stamford Bridge wonder goal with a 35-yard free-kick from wide on the right that landed on the roof of the net. Stoke got on top in the second half, although visiting goalkeeper Asmir Begovic was called upon to save a low shot from West Ham midfielder Cheikhou Kouyate. Arnautovic twice had goals ruled out for offside and it looked destined to be one of those days for Stoke when Mame Biram Diouf hit the inside of the post with a late header. But deep into injury time, Arnautovic drove into the West Ham box from left to right before drilling a low shot past Adrian and in off the left-hand post to earn Mark Hughes' men a last-gasp draw.